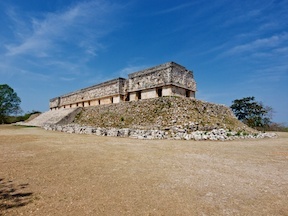 Uxmal is a large Terminal Classic era Maya site, about an hour’s drive south of Mérida in the western Yucatán peninsula. If you’re in this corner of the world, it’s relatively easy to get to (just off highway 261), and has some of the best-preserved examples of Puuc architecture, yet isn’t as crowded with visitors as are some better-known sites. A Photographer’s Guide to Uxmal is a comprehensive guide to the ruins, with an eye toward making the photographs you take there the very best they can be. Containing 3 maps, 24 images, and 25 pages of site-specific material (if printed on letter sized paper), this guide costs $2.99. Once you purchase the eBook, write down your password (from Appendix C of the eBook), and head over to the Uxmal supplemental page for downloadable extras.